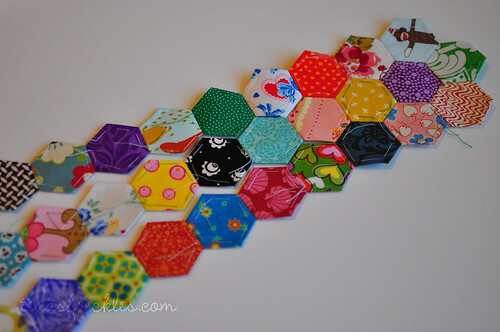 There are many ways to piece your hexagons. I've found that piecing in strips is working nicely for me. In the photo above, I tried piecing in a flower shape (the end with the monkey), but since I'm working with a planned random* layout, I really find I like strips better. I attached strips to my flower and now it looks like a jellyfish! *In my planned random layout, I'm trying to make my quilt look random while avoiding having like colors or prints touching one another and maintaining a nice distribution of colors. I've been sewing strips together and then attaching them to my largest piece once I've created a small section. I like this method for a couple of reasons. One, it's portable. I can sew strips together just about anywhere that type of thing isn't frowned upon. And two, I find that the more I handle my work, the more the back of the hexagons ravel. By piecing smaller sections and then attaching them to the larger piece, I'm handling the larger piece as little as possible to keep the back nice and neat. Above, I sewed the top two rows together (I'm alternating strips of 10 and 11 hexagons) and then laid out the next three rows trying to get a nice color distribution. and tuck them into my box. Although I'm not making a color spectrum layout, I've been sorting my hexagons by color to make it easier to pick the color I want when I'm laying them out or sewing them together. Another reason I like the idea of sewing them together in sections is that I can distribute similar fabrics throughout the quilt. 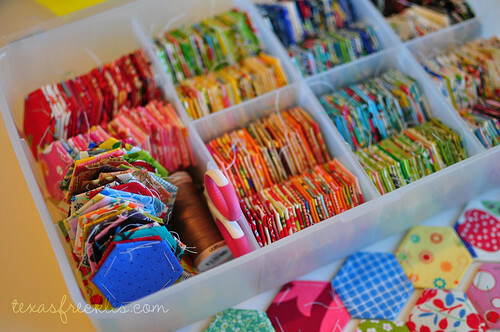 This week, I started making hexagons with a few new charm packs and if I attach all of those now, they might end up clumped together in one section of the quilt (i.e., all of my Hunky Dory could be in one area). If I make small sections, I can attach the sections together later and spread them out. I still haven't attached the section with the duplicate. I'm going to wait until I'm further along and I'll attach that section far away from the section containing it's duplicate. I wanted to issue a little disclaimer. 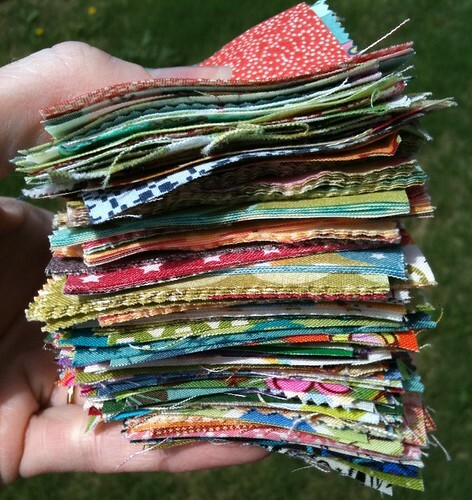 I've been looking around online at English paper piecing. There are many different ways to baste and piece hexagons, so please keep in mind that this is just the way I'm making mine. I think that using squares rather than fabric trimmed into hexagons (paper plus seam allowance) and basting through the paper are both non-traditional methods. My only concern with using squares is the additional bulk on the backside when hand quilting. If you are planning to hand quilt and are concerned with bulk, you might want to try trimming your fabrics before you baste. I tried trimming away some of the bulk on the back of already pieced hexagons and it was pretty easy. I'm not too concerned with removing the basting stitches. Since I haven't tied any knots, the stitches come right out. I'll have more on that later. 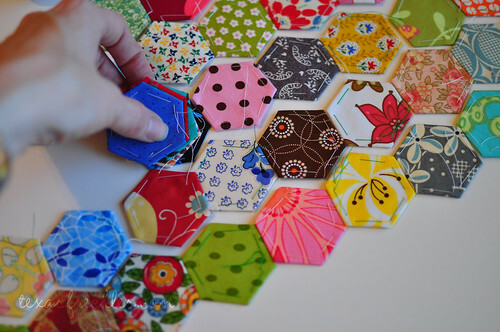 It's really fun to see all the pretty hexagons everyone is making! I've made more than half of the hexagons I need to make a throw sized quilt and I've pieced 272 together. Now that I'm this far along, thoughts of making a larger quilt are creeping into my head. I need to perish that thought! If you have a question and leave a comment, I'm unable to answer your question via email unless your email address is public (or shown) in your profile. I'm trying to reply to all the comments I can, but I'm a little behind! I really do read every one and appreciate the time you take to leave a comment. 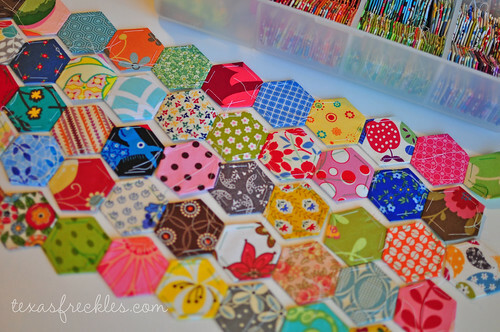 Love love love all your gorgeous hexagons! In my sunshine quilt (my interim hexagon project while I accumulate charm scraps!) I'm finding that I'm sewing a couple of dozen hexagons a day, which I make into one square-ish shape, then attach them to my big piece, so similar to you. I've found that although cutting hexagons of fabric takes longer, I am preferring the lack of bulk - I'm planning on trimming those hexagons that I've made with squares of fabric before piecing them together. I'm hoping to hand quilt both the charm and the sunshine quilt, so lack of bulk is the order of the day. Your quilt's looking gorgeous, i'm loving seeing it coming together. i've been pondering this very issue over the last few days! so thank you so much for all the detail. i havent pieced any yet as i'm so confused! colour flowers or totally random but have same issues about 'type clusters' if i did that. oh my. hi, google had my name spelt wrong so now it's right. i'm Cate aka 23rd Spiral on Flickr. just so you know! your quilt is looking gorgeous! i really love seeing the posts with the progress updates. In my hexagon table runner I sewed in strips until I got to the ends and then I just filled in the spaces. I didn't have any trouble removing the basting stitches once I clipped the stitches on the front of the hexagon. I use fabric squares too and after handquilting this runner, I HIGHLY reccommend trimming excess fabric away before. I did on most of them but I can definitely tell the ones that I didn't as I'm quilting. I love your random layout! This is amazing! I wish I had found you back when you were giving away a hexagon starter kit! Do you sell them on Etsy? I've been wanting to try a few, but the whole idea of cutting them out seems daunting hah! You're very brave! It looks wonderful. These are so cute!! Oh my goodness, really- I love them. Thank you for sharing! I really, really love your hexagons. I'm packing for a trip and want to bring some hexies for the plane. I've also got all mine sorted by color. How do you usually go about selecting them and laying them out?